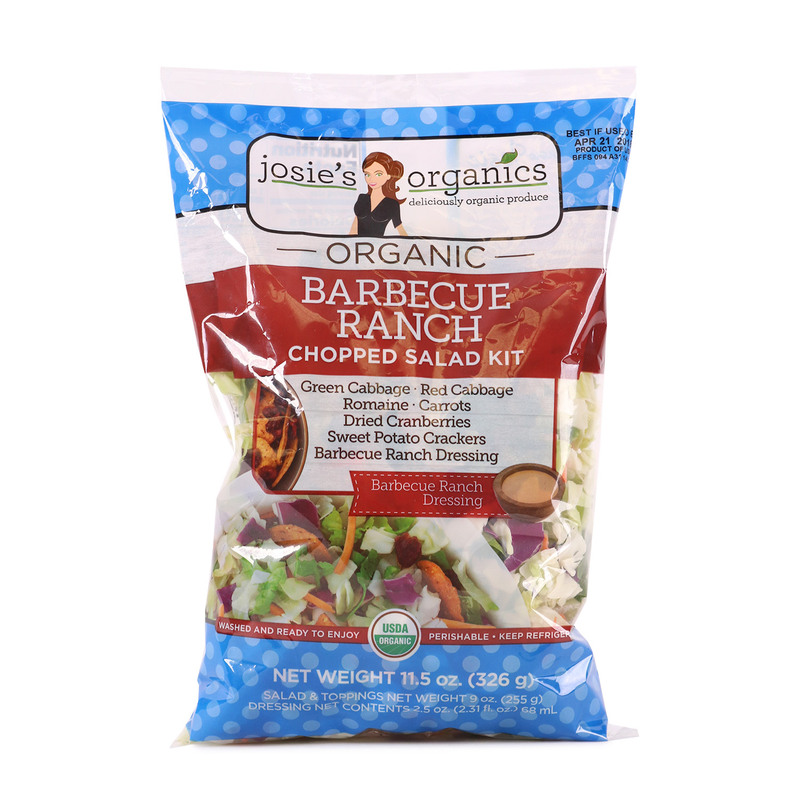 Enjoy the savory & sweet combination of BBQ and ranch in this organic chopped salad kit. 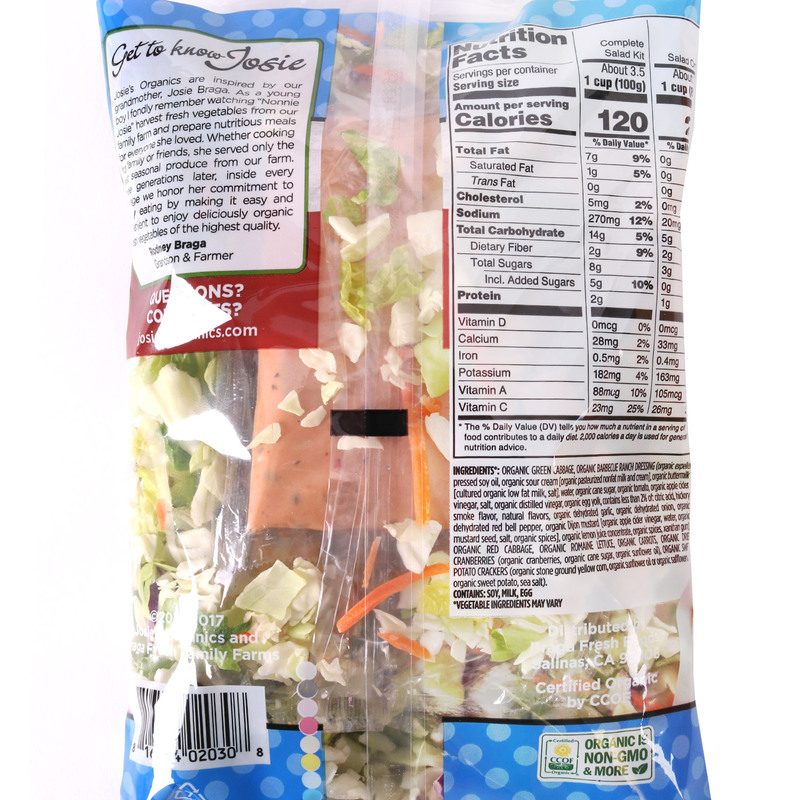 Featuring shredded red cabbage, carrots, and romaine, with crunchy sweet potato chips and chewy cranberries. Topped with a BBQ ranch dressing and you're all set! Organic green cabbage, organic barbecue ranch dressing (organic expeller pressed soy oil, organic sour cream [organic pasteurized nonfat milk and cream], organic buttermilk [cultured organic low fat milk, salt], water, organic cane sugar, organic tomato, organic apple cider vinegar, salt, organic distilled vinegar, organic egg yolk, contains less than 2% of: citric acid, hickory smoke flavor, natural flavors, organic dehydrated garlic, organic dehydrated onion, organic dehydrated red bell pepper, organic Dijon mustard [organic apple cider vinegar, water, organic mustard seed, salt, organic spices], organic lemon juice concentrate, organic spices, xanthan hum), organic red cabbage, organic romaine lettuce, organic carrots, organic dried cranberries (organic cranberries, organic cane sugar, organic sunflower oil), organic sweet potato crackers (organic stone ground yellow corn, organic sunflower oil, or organic safflower oil, organic sweet potato, sea salt).